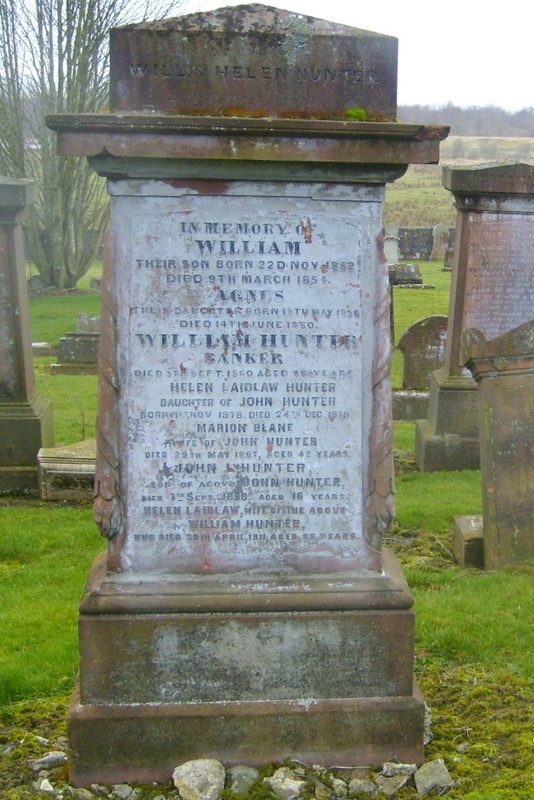 William Hunter the eldest child of John Hunter and Elizabeth Houston was born at Little Garlcaugh farm. As a young man he worked as an agricultural labour at his uncle’s, John Houston, neighbouring farm of Garclaugh. William married Helen Laidlaw the daughter of Thomas Laidlaw of Kirkconnel and Helen Campbell, the sister of Ivie Campbell who had previously farmed Garclaugh. William set himself up as a grain & cheese merchant at Pathhead and three years after the City of Glasgow Bank established a branch at New Cumnock in 1851 he was appointed as their bank agent. Together William and Helen had five children with Agnes and William dying in infancy. Eldest son John continued the cheese & grain business while second son Thomas worked as a bank clerk before later settling in Cumnock where he would later serve as Provost of the town, while youngest son William had an iron-mongers business in Cumnock. John developed the family business in New Cumnock and established a shop in the Castle with a grocery, bakery and general provisions. He married Marion Blane, a dressmaker from Glasgow and daughter of Thomas Blane, Cotton Mill manager. Together they had six children – William, Margaret, Helen Laidlaw, Thomas Blane, John Laidlaw and Marion (known as May). After Marion passed away (1887), John married Margaret Hannah and together they had two children Jessie and Hugh. John Hunter was one of several public-spirited merchants in the town and was a great supporter of the annual Old Folks Party as well as a founder member of the New Cumnock Bowling Club. When he passed away at 82 years, he was fondly recognised as ‘the elder statesman of the Town’s merchants’. John’s sons Thomas Blane and Hugh had both been injured during World War I and he employed a private nurse Catherine Campbell to look after them. Thomas and Catherine later married and took over the family business and he played an active part in community affairs including chairing the annual Wardens and Police dinner. Together they had three children Mary, John and Campbell. Mary married Robert Laurie of Knockburnie Farm, near Dalleagles. Eldest son John became a teacher and was later appointed Depute Rector at Cumnock Academy. Youngest son Campbell became the fourth generation of Hunters “Merchants of New Cumnock2. Many thanks to Janice Yates (nee Hunter) and her Aunt Mary for the family photos and family information.